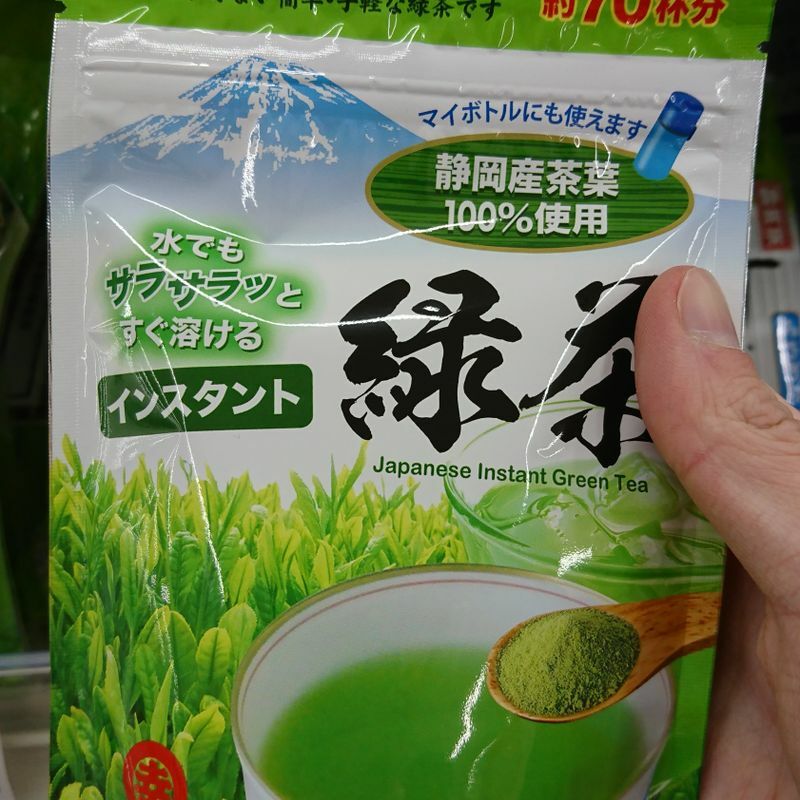 How Good is Instant Shizuoka Green Tea? 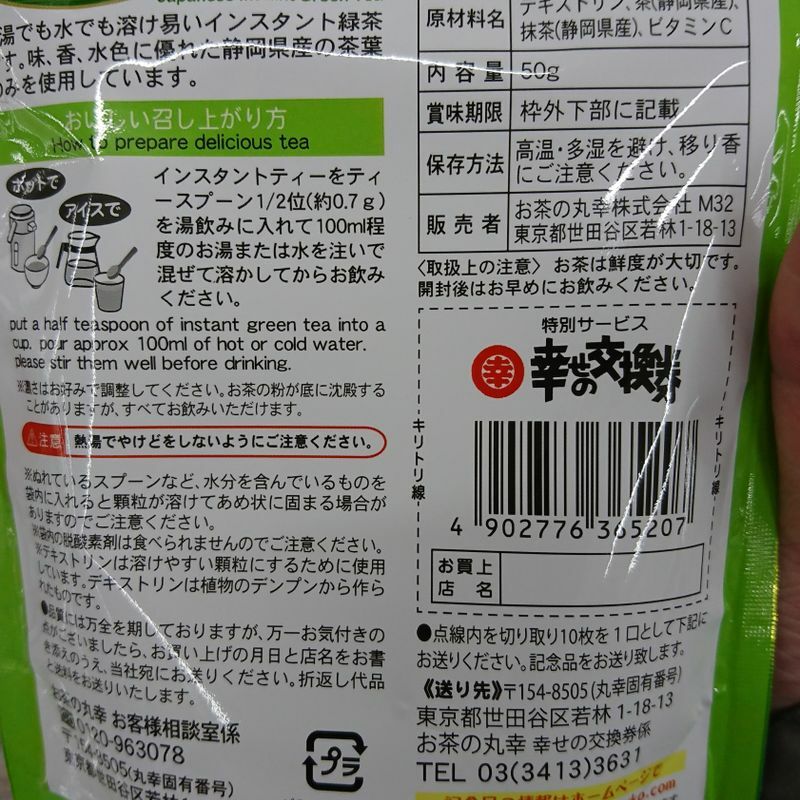 Throughout my journey of Shizuoka green tea (or green tea, or even just tea in general), I have always been drinking tea brewed from tea leaves, which always required me to wait patiently until the flavour is well dissolved into the water. And that is also why I never really believed in instant tea. I see some co-workers would who rip over a little tube of tea powder, add hot water, stir, and come out with a cup of English Breakfast. “No way”, I thought, “would this be as good as the “real” stuff. Then one day, I found this pack of instant Shizuoka green tea at the local drug store, and since I have been very satisfied with every Shizuoka tea I have had so far, hot or cold, from leaves of bottled, I felt that I should give it a try. The powder of this tea is very fine, and dust floats up when I dig into the bag with the tea spoon. I sprinkled it into a mug nearby and added some hot water. Thanks to how fine it is, I feel like there was no need to stir the tea and it was automatically dissolved and brewed. It is quite nice and comforting especially since it took me merely seconds to prepare, though it is not as rich as the normally brew tea. The package advertised the selling point of “instant”, even if you are using cold water. That is indeed very convenient, since my cold brew green tea always takes overnight so I would always have to plan ahead and get my bottles ready. It would also free up some fridge space. Personally I find the flavour of cold brews more robust than hot brews. The flavour of this instant cold tea, however, confirms that it is indeed not as rich and sophisticated as the cold brew I make. The colour is quite light, and there is an evenness to the consistency that reminds me of instant noodle soup (good, but still different from actual ramen soup). 400 yen for 70 cups seems not bad, but each cup is only 100mL according to their measurement. Therefore, I can make only 7L with this whole bag, or 14 servings of my usual cold brew. It is not a lot at all, so considering what is more cost effective, I will keep this bag as a back up for when I forget to prepare the night before. Lastly, I got to point out that this package does have English instructions, which I have never seen anywhere else. Patience is still key, especially if you want quality or want to save money.